At first sight this seems a collection of two halves. Life Class opens with twenty-eight poems on various subjects (although many are prompted by the visual arts) to be followed by the twenty-five poem sequence which gives the collection its title. Only after the initial reading does the connection become clear, as the sequence “Life Class” explores what it is like to be the silent subject of close observation – the model for a life-drawing class – while the earlier poems examine art from the observer’s side. The ekphrastic poems gain depth from the personal experience of being the subject of art – an experience that is impersonal. The students focus on the body while the model focuses on: what, exactly? Taken as a whole this makes for an intriguing and thought-provoking examination of the art of looking. ‘How much looking/ is needed to see beyond the form?’ asks the poet in “Life Class (ii)”, a question that sends the reader back to the beginning of the book to try to answer that question. DeVaughn’s voice is quiet, as suits her role as an active observer, one who wishes to see beyond the surface. In “A Meeting of Angels” she considers how to look at a white marble sculpture, a group of angels, trying to understand the relationship between the physical weight of marble and the angels’ other-worldly quality. to break surface, fly free. The immediacy of the colours defines the intensity of the moment. 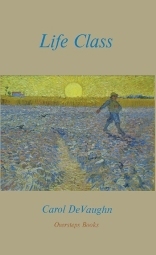 She has a way of using double-spacing to allow images, especially colours, to stand separate and to allow time for the reader’s inner eye to catch up with the words on the page; we see the effects of this in “A Kind of Blue” and “Horizon”, where the ‘two shades of grey’ that are sea and sky give the tone of the whole poem. She doesn’t over-use this technique, despite its effectiveness; in “On Rothko” the conventional spacing evokes the close bands of colour can ‘reveal the geology of feeling’ of his paintings. down to ground, reversing the order of things. and the darker side of light. rise like this night’s full moon. on the elbow, cheek on cupped palm. How many times have you seen this pose in a drawing, not considering how the body would set into this shape? ‘I re-align my spine, re-gear my joints before daring/ to stand …’ she writes, before she can ‘Amaze myself by walking across the room.’ By the end of this short poem we share the feel of stiffness, the relief of movement. Only then does DeVaughn take us into her visual field, the patch of paint-flecked studio wall and colours that seem brighter because she cannot turn away from them. fiery suns on azure field. Later, they will ‘… go deeper than my skin. […] digging for what they cannot see.’ For the model a lopsided spot of red paint becomes Jupiter’s Giant Red Spot. In another pose, curled into an armchair her imagination lets her become a bear, or explore the wildlife of the Himalayas, or inhabit remembered paintings; it all rises out of the starting point of stillness. Her mind can explore the wider world while her body is motionless. Re-reading the first half of the collection after the intense, centred immobility of this sequence is to see DeVaughn’s poems with new eyes and deeper awareness, both for the surface texture and for her sensitivity to every movement and colour. She ends with the lines ‘we share nakedness/ and the uncertainty of flesh and bone’, a lightness that returns us in a very satisfying way to the opening poem, where the viewers are aligning themselves with the angels.